Activists take inspiration from Rosa Parks, Gandhi and the Ruckus Society. REUTERS A Tibetan exile in Dharamsala protests the Beijing Olympic Games last August. The poster says, Release Political Prisoners. When Everett Gendler, an 80-year-old rabbi from New England, asks the class of Tibetans to describe what the word “power” means to them, the students hesitate at first. But as they go around the circle, they warm to the task and come up with some telling responses. Power means “something frightening,” says one young woman in soft English. Power means “bad or evil”; it means “violence” and “someone who monitors things,” some other students offer. These Tibetans, in their late teens and 20s, are recent refugees who fled their homeland to this city in neighboring India, home to some 140,000 Tibetan exiles. Some of the young men sport trendy haircuts–spiky, tinted red or slacker shaggy–that must be fashionable back home. They hail from Tibet’s cities as well as from farming and nomad families. Although it is their winter holiday, about sixty Tibetan students are attending this two-week workshop on “active nonviolence,” led by Rabbi Gendler, his wife, Mary (a psychologist), and staff from the Active Non-Violence Education Center (ANEC) in Dharamsala, the northern Indian hill town that has been home to the Dalai Lama for nearly fifty years. Over the next few days ANEC will lead a workshop based on the teachings of Gene Sharp, who outlined 198 methods of nonviolent action in his 1973 book, The Politics of Nonviolent Action. What are two Americans doing teaching peaceful resistance to Tibetan Buddhists, of all people? Rabbi Gendler, who has long white hair and a resonant voice, admits Tibetans already know about nonviolence. But ANEC provides something more. “We’re teaching them how to do it,” says Gendler, who founded ANEC with his wife in 2007 after retiring as Jewish chaplain at Phillips Academy in Andover, Massachusetts. On the eve of the fiftieth anniversary of the Dalai Lama’s exile in March, freedom for Tibet remains elusive. The Chinese government has tightened a clampdown in Tibet that began last March after pro-Tibet demonstrations erupted across the country. About 120 Tibetans and several Chinese were killed last year in the worst violence in China since Tiananmen Square in 1989. The most dramatic headlines have subsided, but arrest and sentencing of Tibetans quietly picked up after the Olympics, says the Tibetan Centre for Human Rights and Democracy in Dharamsala. In anticipation of this year’s fiftieth-anniversary milestone, China launched a “Strike Hard” campaign in January; it has led to a sharp rise in arrests, raids and interrogations as authorities tighten control in Tibet. Despite the deadlock in talks between the Dalai Lama’s envoys and their Chinese counterparts, pro-Tibet momentum outside China has increased. In recent years, activist groups have become more organized, media savvy and technologically sophisticated, allowing them to harness broader support among Tibetan exiles as well as international sympathizers. Mohandas Gandhi famously said, “I have nothing new to teach the world. Truth and nonviolence are as old as the hills.” But for the pro-Tibet movement, better nonviolence training and education have been critical to stepping up the campaign in the hills of Dharamsala and far beyond. Yet if you walk through the winding streets of this town in the foothills of the Himalayas, you will see peaceful resistance on full display. Walls are plastered with fliers advertising pro-Tibet candlelight vigils, discussions and films. Young Tibetans casually sport T-shirts with slogans declaring Justice Has Been Raped in Tibet. Stooped elderly women wear trendy zip-up sweatshirts with Team Tibet 08 stenciled on the back, as do foreign backpackers. In the week before Losar, the Tibetan new year (which began February 25 this year), the streets of Dharamsala were covered with black posters declaring No Losar Celebrations, to Express Our Solidarity With Tibetan Martyrs. This year there will be no concerts, dance performances, fireworks or guzzling of chang (Tibetan barley beer). Instead, Losar will be marked by marches, solemn prayers and a hunger strike. Tibetan exiles are following the lead of compatriots inside Tibet who refuse to celebrate Losar even though Chinese officials offered money to encourage festivities, according to blogs in Chinese within Tibet. The boycott comes even though China has declared March 28 “Serf Emancipation Day”–a new holiday celebrating the abolition of the Tibetan government in 1959. Students for a Free Tibet (SFT) is channeling that impatience. It helped train Tibetans in how to stage nonviolent protests last year in the months before the Beijing Olympics. In a video of last year’s training, a Tibetan activist warns participants–including red-robed monks–that the “Indian police will use rude language to make us angry…. We will win the police over through our peaceful approach.” Another activist shows Tibetans how to wrap their legs around each other to form a sitting human chain that will be hard for police to break up. “Cross your legs like this and hold the legs of the person behind you,” he demonstrates while tugging at a participant’s ankles. Tenzin Choeying, the 30-year-old national director of SFT in India, has been arrested several times for participating in peaceful protests. Choeying, sporting a goatee and a black jacket, sits on a sofa in SFT’s office in Dharamsala beneath a whiteboard listing documentaries about Tibet that are for sale on DVD. He describes how far pro-Tibet activism has come since his days at Delhi University, when just a handful of Tibetans would show up to protest visits by Chinese leaders. 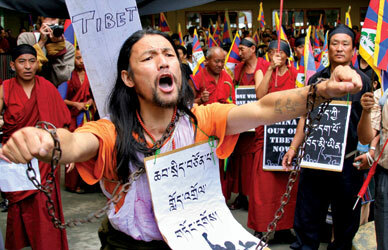 In 2007 a rally in Delhi organized by the Tibetan Youth Congress drew an estimated 25,000 Tibetans from across India. Last year the five major Tibetan NGOs in Dharamsala came together for the first time when they organized a four-month March to Tibet, from Dharamsala to the Tibet border–a trek of 745 miles. Before the march, participants debated whether they needed training. “The elder Tibetans said, ‘We don’t need it. It’s inherent.’ The younger Tibetans knew training was essential,” says Choeying. The message of the march was amplified through e-mail and text-message alerts, a website, blog and live satellite video of the march. Media training helped with holding press conferences and writing news releases. The Internet is essential for getting information to those within Tibet, where savvy computer users still manage to get around government blocks. SFT has matured with help from Greenpeace and the Ruckus Society, the group that helped shut down the 1999 World Trade Organization meeting in Seattle. SFT created its own ruckus in 2007 when activists boldly unfurled a Free Tibet flag at Everest Base Camp in Tibet and broadcast the proceedings live on the Internet via satellite streaming video. Tibetan activists are also well aware of Gandhi’s legacy in their refuge home of Dharamsala. Gandhi’s photo often hangs alongside that of the Dalai Lama in Tibetan offices. Swaraj Peeth, a Gandhian NGO in Delhi, has co-led training camps for SFT on Gandhian thought and philosophy. Legacies of the world’s nonviolent resistances overlap in India. Martin Luther King Jr. studied Gandhi’s legacy in India and brought lessons back to the United States. In late February Martin Luther King III finished a tour of India that retraced his father’s pilgrimage here fifty years ago to learn about Gandhi’s use of satyagraha, or “truth-force,” to win independence for India. In another nod to history, the Tibetan Youth Congress sings “We Shall Overcome” after its meetings. As marchers straggled over hilly roads last year, carrying posters of the Dalai Lama and Gandhi, they met blockades of khaki-clad Indian police. Amy YeeAmy Yee has reported from South Asia for The New York Times, The Economist, The Wall Street Journal, The Washington Post, NPR, and other publications. She is a former Financial Times correspondent.